Used for Ground Connection to ROHN Tower down guy concrete Anchor Rods (0.375 to 1.00 inch actual OD range). Lug connects the 7/16 6x25 EIP IWRC RRL wire rope utilized in REV. 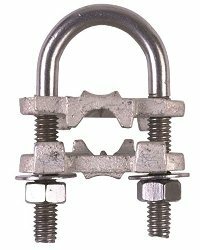 G Grounding Kits (not included)... Harger CPC Pipe Ground Clamps compare to Burndy GAR.